So, first of all, as I responded to this individual so I respond to you. My apologies are offered if our prayers on Christmas Eve offended you, or anyone, for that matter. What ever we pray about or preach about is open to discussion and mutual edification, and sometimes we just get things wrong. What did excite me, however, was the opportunity to talk some theology at Trinity – so I’ll be unapologetic about that. It’s time we did some “God-Talk”, some theology, here. In the years that I have been with you I have encountered more than once a great deal about what we aren’t. I’ve heard, “Oh, we don’t do that”, or “we are well beyond that”, or “we really don’t believe that.” There is precious little talk about what we do believe. That, perhaps, will need to change, but right now, let’s wrestle with that petition, and the notion of what Jesus means to us. I’m going to do that in two steps, based on the readings for this morning – so step one. St. Paul gives us some direction when he writes in the Second Lesson for this morning: “But when the fullness of time had come, God sent his Son, born of a woman, born under the law, in order to redeem those who were under the law, so that we might receive adoption as children.” Paul is wrestling with an “us” – “them” problem, as he writes to the people of Galatia. The question he addresses with them and indeed with the whole emerging church is about what role the Mosaic Law will play in the life of gentile Christians. Paul’s strategy of basing his emerging churches on a core of Jewish believers was brilliant. However, when gentiles began to hear the Good News, and began to be attracted by its message, a new question arose. Did these people need to follow the dietary laws of Judaism, or the laws regarding circumcision, or work on the Sabbath? When the early Christian authorities in Jerusalem said, “Yes, new Christians must follow these laws,” Paul replied with a resounding “No.” It will do us well to understand Paul’s stance over against the Jews and Christianity. If we read Romans and Galatians deeply, we will come to understand that Paul sees the Jews as having not been abrogated from their role as God’s chosen people. They continue to enjoy that status and that righteousness. However, to underscore the argument about keeping the Jewish ritual law, Paul uses a very interesting word in his letter to the Galatians. He says it quite succinctly in the reading for today: in order to redeem those who were under the law, so that we might receive adoption as children.” Adoption! We are the adopted ones, the “others” who are taken from the outside and brought in and included. There is immense room in Paul’s theology for the other. Third Isaiah has a similar notion in the first reading for this morning, when he uses these phrases in describing an Israel that returns to a devastated Jerusalem with its temple destroyed, and its people disenfranchised: “clothed with salvation,” “robed with righteousness,” “you shall be called by a new name.” We might ask ourselves, “Who is the recipient of this grace, this ‘redemption of those under the law’”? The answer is all of us – all who are welcomed in, or who want to come in, all who seek God, regardless of status or religion. Both Matthew and Luke have elaborate Birth Narratives, replete with angels, shepherds, wise men, evil kings, and gentle animals. It is Matthew who bases his Birth Narrative, in part, on the story of Moses, but it is John who basis his “birth story” on something entirely different. John’s prologue, which was just read as the Gospel, is a retelling of the Creation Story from the first chapter of Genesis. In this retelling of the creation story, John reminds us of the strong word that comes from the mouth of God - breathing over the tohu vobohu, the formless void. John sees Jesus, present at the moment of creation, participating as the very Word and breath of God, bringing light and life, separating dark from light. 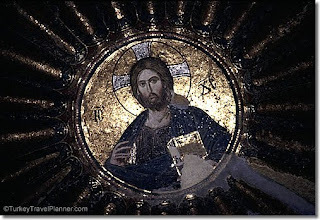 In this image we see Jesus as John saw Jesus – the pantocrator, the creator of all. It is this image of Jesus that might be most useful to us as we explore the quandary of our prayer and petition. It is this Jesus who is in all, and who made all, who embraces all, that gives us a clue about our role as Christians among other believers. We live in a world without boundaries, and so did the Romans, and Greeks, and other peoples living at the time John and Paul wrote their words. A thousand religions, and mysteries clamored for the hearts of those who would hear, and so it is today. We do also live in a time of exclusive claims. One only has to listen to fundamental Islam, Christianity, Judaism, or Hinduism to understand that. “We’re right, and you are not!” The response to such exclusive claims cannot be constructed of our own unbending exclusivism. We must remember the Jesus who creates all and who embraces all. At the 9:00 mass, I spoke about this problem with an old friend who showed up here this morning, and he offered me a wonderful insight. Remember the words of the petition? “For the conversion of the whole human race to our blessed Lord and Savior Jesus Christ.” My friend Michael offered this interpretation, which I thought, was particularly fine, and I offer it to you. The conversion we pray for, he said, is the conversion of ourselves so that in seeing the other (those not like us) we may see Christ instead. That is profoundly at the core of what we need to be as a people following Christ. We need to be ready to see him in anyone we encounter. We also need to be ready to talk about our relationship with Jesus – the Jesus who makes sense of it all for us. As we talk to others about faith, Jesus is our touchstone, our wellspring, our metaphor, our deep understanding of the world and its questions. It is this that we commend to others. It is this conversation that we of faith, need to have one with the other. It is this dialogue that we need to have with others who have no faith. The goal is to live in the world where the image and body of Christ (remember who that is) embraces all. 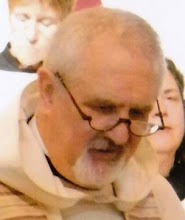 So thank you, member of Trinity, who brought this to my attention, and thank you to Ormande Platter, Deacon of the Diocese of Louisiana, who wrote the petition and engaged us all in God Talk – Theology. the snares of death surround us..."
I could not get these lines out of my head as we watched Tom Ford's remarkable film, A Single Man. Aside from the plot which tracks an individual's grief over a lost love, and through whose gaze we are enabled to see so much other grief and sorrow, there are other layers of insight and vision. Placing it in the early sixties accentuates the "not yet" quality of gay life. Freedoms beckon and are lived, but there is the usual cruelty and disregard. Learning of his partner's death, the main character, George (Colin Firth) must abide the condescension of a family member, who informs him that the funeral is "for family," effectively denying him the ability to grieve finally and publicly. The politics of this, however, is incidental. The problems that Tom Ford pictures and that Colin Firth so effectively portrays, belong to more than just one class of people - they are universal. That is the appeal of this film. I found the visuals to be truly amazing, perhaps because they mirrored my own way of perceiving things. I will be bold and say that I don't think that I am unusual in this regard, but live in a long tradition of gay men seeing things in a certain way. Ford has us see with the main character's eye, and we track from eye (lot's of eyes) to mouth, to chin. Some may link this to Ford's career in fashion, but I think that it is more than that. It is the way some of us see - focusing totally on what is beautiful to behold, often so much that we stop listening. In one remarkable scene we watch as the character played by Julianne Moore makes up her eye in full early sixties Cleopatra mode. The mirror, however, that reflects the eye is distorted, and the attempts to beautify are actually ugly. Through such images Ford signals directions in the story, and the character of those who encounter George. The story is a debate about death and life. It is about all the arguments, either for the one or the other, and the choices that we are allowed to make or not to make. Temptations come, and Ford chronicles each of them carefully - making them as attractive as possible. 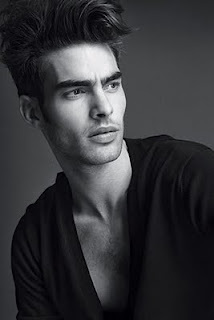 But again, he allow's the camera to be come George's eye, as it tracks from the stubble on Jon Kortajarena's chin, to the smoke that gently drifts from his open lips. We don't need to be told what the characters are thinking or intending - the visuals say it all. In effect the grief, on the part of each of the characters, is a search - a search for some kind of normalcy and new life. Each of the invitations/temptations stand on their own, and are only seen in clarity when they have been rejected. This film also studies memory. As George remembers his dead lover, and memories are stirred by place, sound, or smell we see the memory. It is all utter happiness - no bad moments, fights, or difficulties invade this space hallowed by George's grief. There will be time for reality to creep back in. The business at hand is fully taking in the loss. Perhaps that is why each of the temptations are held at arm's length - there not being any psychological time to actually evaluate them and engage them. They are kept in abayence. Perhaps it is my Mad Men frame of mind lately, but I especially enjoyed the sixties aspect of this film. Were the sixties really that elegant. Julianne Moore's dress in the dinner scene is wonderful, as are the stationary, cuff links, suits, and house that George lives in. Below the visuals, Ford captures sounds that we simply don't hear any more. There is the sound of an old telephone being put into its cradle, or the sound that the dial of a "Princess Phone" makes. I especially like the sound of a needle being placed on a LP recording - that soft, fuzzy, "pop" that began the recording. All of this works to place us in a world that could have easily just been a fashion advertisement, but has been made a world we all lived in to some extent. A final note of praise. 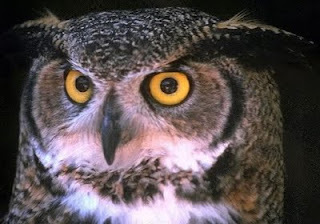 I like all of Ford's symbolism, especially in one of the final scenes where the flight of an owl signals wisdom, death, flight, and clarity. This is a film that can be mined for so much more. Should I read the Isherwood? If you've been to our house, you know how evident our love of books is. Recently, three new volumes have come into my library - let me introduce them to you. The first is Per Pettersen's "Out Stealing Horses", a charming tale of growing up in a Norway complicated by Nazi's, personal tragedies, and incipiant love. This is one of the most calming books that I have ever read. My immediate reaction was, "I want to live here - I want to be satisfied in this way." Fiction has never interested me, although lately through the good graces of the Trinity Book Club, I have learned to see beyond what I thought was contrived, and to see the art. A recent reading of Faulkner's "Absolom, Absolom!" convinced me of that. This book, however, simply touches those things that we all know, and with which we are familiar. I saw myself, and my own experiences in the commentary of the main character. Pettersen has an uncanny knack for writing a convincing geography into which his characters are placed and move. Rather than focusing on a single moral, or verity, he explores several. Childhood is like that, as we taken in more and more of the world. I recommend this one highly. I have been wanting to purchase this one ever since it was first published a couple of months ago, but it has been difficult to find - selling out at several stores. I am not a fan of Crumb's, and by that I don't mean that I don't like him, rather that I have not followed him, particularly. Familiar with his work, I wanted to see what he would do in his "The Book of Genesis Illustrated". As an armchair biblical scholar and theologian, and as a priest I have more than a glancing interest in this book. Of special note is the translation by Robert Alter, who has, in addition to his translation of "The Five Books of Moses" also completed a translation of the "Psalms." This professor of Hebrew and Comparative Literature at UC Berkeley has provided Crumb with a readable and lively text, absent the implied images of the King James Version. Crumb's work is to supply the reader with an alternate visual as the text is read. In glancing through the copy I recently obtained, I realized that I had simply not read a great deal of the book - Crumb's drawings grabbing my attention and interest. I'm going to have to do something with this at Trinity. Finally, I saw a copy of Orhan Pamuk's new book, "The Museum of Innocence", in a bookstore in Austin, and had to have it. I have been a fan of this author for several years now, "Istanbul", "Snow", and "My Name is Red" being among my favorites. The structure of this book is for savoring, as you enter his world in Istanbul, and as you meet family, and involve yourself in the events that structure the world that is his Istanbul. When I read Pamuk, I am reminded of Umberto Eco, but as an arbiter of a non-western cultural reference. Pamuk either sends me off to the dictionary, Wikipedia, or a history book. Reading his work is never a solitary experience. I've only just begun this book and will have to report more later - but as of now, I'm finding it addictive.